DETROIT, Michigan, May 12, 2011 (ENS) – A giant photovoltaic solar array soon will power the assembly line at General Motors’ Detroit-Hamtramck where the Chevrolet Volt extended-range electric car is built. The Detroit-Hamtramck facility was chosen because the Volt is manufactured there, GM said, announcing the solar project on Wednesday. “This array will significantly decrease energy consumption by combining solar power with ongoing efficiency tactics such as lighting and equipment upgrades and automating equipment shut-down,” said Bob Ferguson, vice president of GM Public Policy. The largest solar PV array in southeast Michigan, the 516-kilowatt installation will generate electricity capable of charging 150 Volts every day for a year – a total of 54,750 Volt charges. Covering 264,000 square feet, the project is slated for completion at the end of the summer and will save the facility about $15,000 per year over the 20-year easement agreement. “Making sustainable choices is good for both the environment and our bottom line. Obviously cost savings is critical for GM, and the ability to save $15,000 per year while being environmental serves us well,” Ferguson said. The Detroit-Hamtramck solar installation is part of DTE Energy’s SolarCurrents pilot that calls for photovoltaic systems to be installed on southeast Michigan customers’ property or rooftops over the next five years sufficient to generate 15 megawatts of electricity. DTE Energy is investing $3 million in the solar array at Detroit-Hamtramck. “Our partnership with GM is another example of how our companies work to build a more energy-efficient and sustainable future,” said Trevor Lauer, vice president, marketing and renewables with Detroit Edison, the largest DTE operating unit. “Our SolarCurrents program was designed to increase the demand for renewable technologies in Michigan, and it is our hope that installations like this one do exactly that,” said Lauer. DTE Energy and GM will place the array of solar panels on a six-acre tract of land located on the south side of the plant. This placement allows it to face true South to maximize solar output. The array will complement other green activities at the Detroit-Hamtramck plant, which in March was named a Michigan Clean Corporate Citizen for its commitment to the environment. Teri Quigley, plant manager for the Detroit-Hamtramck Assembly Center, said the employees who build GM’s greenest vehicle are excited to be recognized for other green efforts around the plant. Not only is there is a 16.5 acre certified wildlife habitat on the site, but also GM has installed an oxidizer that reduces the amount of carbon dioxide and carbon monoxide released into the atmosphere from the plant. In addition, efficient lighting upgrades and other energy efficiency projects will save the plant nearly $3 million per year in energy costs, GM said. GM uses renewable energy in the manufacturing process, deriving energy for manufacturing operations from solar, hydro, and landfill gas resources. 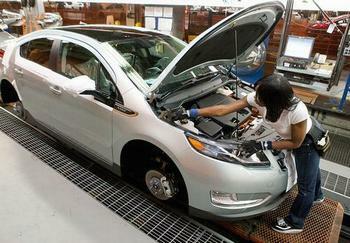 In the United States, 1.4 percent of GM’s energy consumption comes from renewable resources. Solid gains by GM’s fuel-efficient passenger cars and crossovers powered a 27-percent increase in sales of GM vehicles as compared with April a year ago, the company announced last week. With gasoline averaging almost US$4 per gallon across the United States, consumers are beginning to trade in larger vehicles for smaller, more fuel efficient ones. General Motors announced Tuesday it will invest about $2 billion in U.S. assembly and component plants, creating or preserving more than 4,000 jobs at 17 facilities in eight states.